You just knew the White House wouldn’t let CNN off that easily. 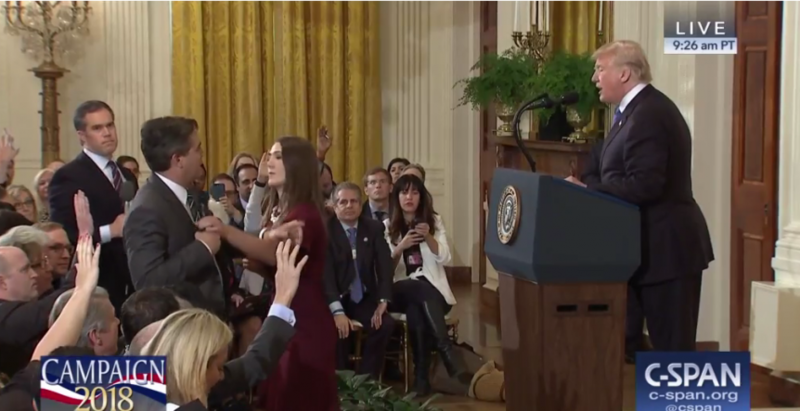 Just hours after the network and its chief White House correspondent Jim Acosta won its federal court case to get the reporter’s White House press pass back on a temporary basis, Trump administration officials sent a formal letter to Acosta stating that he will once again have his pass suspended when the 14-day restraining order expires at the end of the month. And CNN is now asking is asking the U.S. District Court for an emergency hearing to make sure that doesn’t happen. According to the network’s chief media correspondent Brian Stelter, the letter to Acosta was signed by two of the defendants in the CNN lawsuit, press secretary Sarah Sanders and deputy chief of staff for communications / former Fox News co-president Bill Shine. The letter cited his behavior at President Trump’s Nov. 7 post-midterms press conference. Stelter writes that CNN and Acosta made another court filing this morning, and they’re hopeful the parties “can resolve this dispute without further court intervention.” The network is also seeking a hearing on a preliminary injunction “for the week of November 26, 2018, or as soon thereafter as possible,” according to the same filing made this morning.